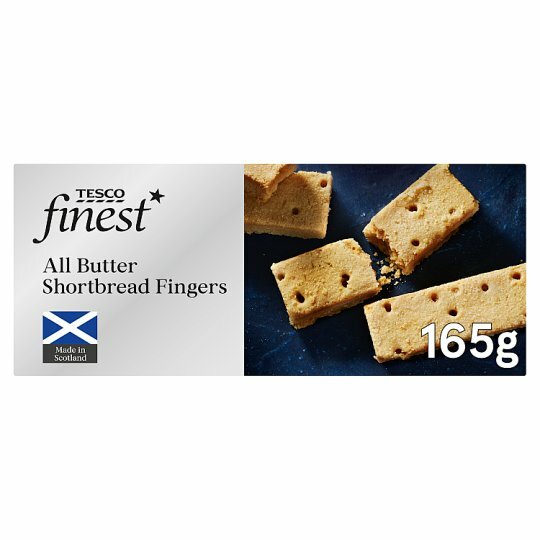 All butter Scottish shortbread fingers. All Butter Shortbread Fingers Our classic shortbread fingers come from a small, second generation family bakery in Aberdeenshire. They use a traditional all butter recipe, tray bake them for a beautiful melt in the mouth texture and 'dock' them by hand for a traditional finish. INGREDIENTS: Wheat Flour [Wheat Flour, Calcium Carbonate, Iron, Niacin, Thiamin], Butter (Milk) (32%), Sugar, Maize Starch, Salt.